Three stone engagement rings are set to be one of this year’s most popular engagement ring styles. 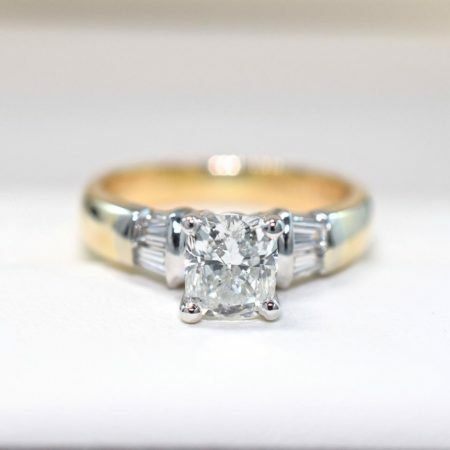 As a premier designer and creator of fine custom jewellery and engagement rings in Winnipeg, we have the honour of getting to spot trends well before they take hold. Whether this rise in popularity among three stone rings has come as a result of Meghan Markle’s engagement ring or the elegant versatility of this style, we felt that we should dedicate this article to a few of the amazing style options available when it comes to three stone engagement rings. 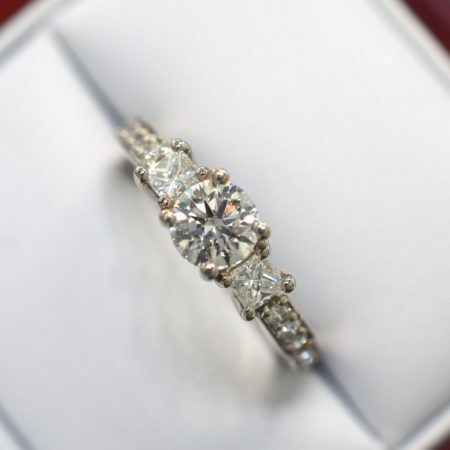 The significance behind the three stone design is that it symbolizes the past, present and future of one’s relationship, and for this reason makes an excellent choice for both an engagement ring or an anniversary ring. So without any further delay, here are a few styles of three stone engagement rings that we think you will love! This ring features one of our favourite diamond cuts, the cushion cut. Displaying just about as much brilliance as the round cut, the cushion cut diamond features a square shape but with softer and rounded corners. This ring is also somewhat similar to that of Megan Markle as her ring also features a centre cushion cut diamond. If you love this diamond shape as much as we do, be sure to check out our article on cushion cut engagement rings! 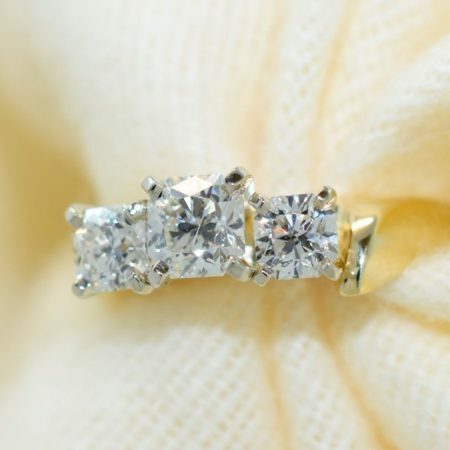 Yellow gold has been a very popular choice for engagement rings for the past couple years. Where white gold had pretty much dominated the market throughout the mid 2000’s it seems like may people are loving the traditional warm tone of yellow gold in both their engagement rings and wedding bands. This above design features three brilliant square cut Canadian diamonds set in a simple yet elegant three stone design. As you probably know by now, sapphire engagement rings are one of our specialities! 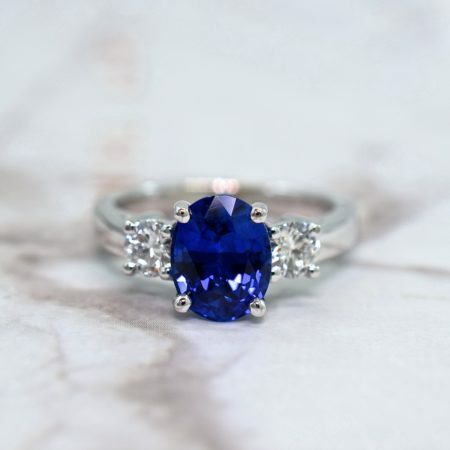 Since, we are on a roll with talking about royal engagement rings, we had to include this design which features an absolutely magnificent blue ceylon sapphire, which is the same kind of stone set in Kate Middleton’s engagement ring, which previously belonged to lady Diana. This particular design sets the centre sapphire between two brilliant round diamonds. The large oval centre stone and smaller round stones creates an elegant tapered look to the ring giving it a modern but regal appearance. Aside from sapphires, we also create many designs which feature other fine precious gemstones. 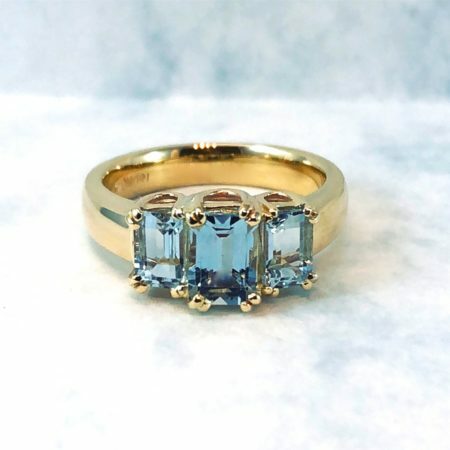 This ring features three beautiful aquamarine stones. As one of our most loved designs on instagram, we have had many requests for similar designs to feature everything from peridot to emeralds. This ring features an expertly cut round diamond with a princess cut diamond on either side in a pave band, creating an incredibly bright band of sparkle. The different diamond shapes serve to create a wonderful contrast and symmetry to this timeless design. To learn more about this ring, check out this article here. Thanks very much for reading this article on three stone engagement rings with triple sparkle. Don’t forget to connect with us on facebook, twitter or instagram!